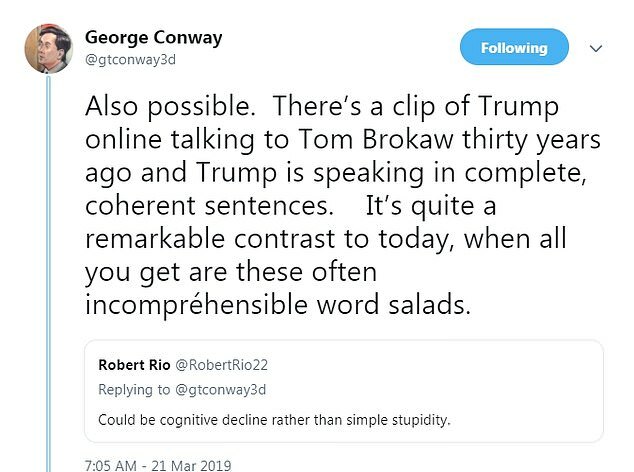 George Conway suggested Thursday that Donald Trump is in 'cognitive decline,' in spite of a public warning from his wife - a senior adviser to the president - that he's not qualified to dish out medical advice. Trump had raised the temperature Wednesday in his feud with Conway, calling him 'a husband from hell' in a tweet and telling reporters that he's 'a whack job.' The back-and-forth prompted the lawyer's wife, Kellyanne Conway, to publicly side with her boss in the month's long spat. 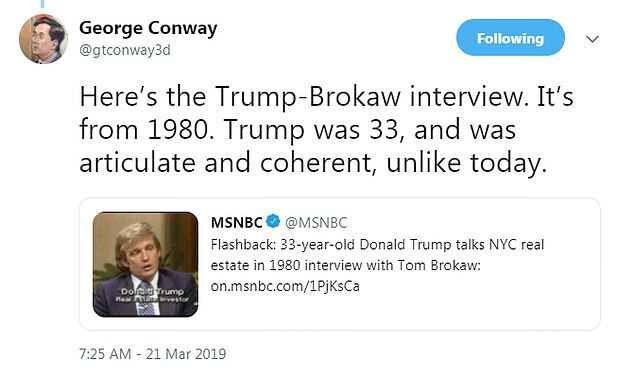 The next morning, George Conway was back on the attack, promoting a decades-old Tom Brokaw interview with a 33-year-old Trump as evidence for his argument that Trump is nuts. He also claimed the president is a 'compulsive liar,' and that's why Trump's lawyers didn't want him talking to Robert Mueller. After calling Trump 'dumb' in one assessment, Conway said, in response to a follower's claim that Trump could be in 'cognitive decline,' that it's 'possible' the 72-year-old president is losing his mental faculties. 'Also possible. 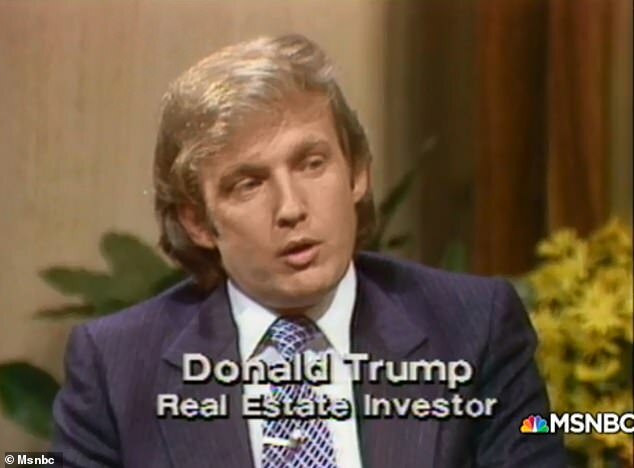 There's a clip of Trump online talking to Tom Brokaw thirty years ago and Trump is speaking in complete, coherent sentences. It's quite a remarkable contrast to today, when all you get are these often incompréhensible word salads,' he said. The former campaign manager for Trump who followed him to the White House has avoided comment on her marriage and her husband's derogatory remarks about her boss. She addressed the clash at length for the first time on Wednesday, in a Politico interview. Conway said her first priority is the 'protection' of the four children she has with George. She said her husband encouraged her to work for the president and was 'enthusiastic' about the family's move from New York to Washington at the beginning of the Trump administration. 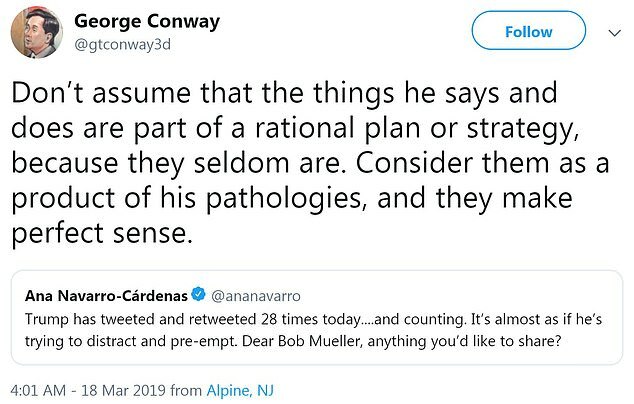 Conway argued that her husband's tweets are meaningless, as he does not have the power to act on his assessments in the way Mueller, the deputy attorney general or a talk show host does. Her husband produced a letter this week affirming his claims that he turned the DOJ job down. He also shared screen-grabs from a psychiatric diagnostic manual to back up his claims that Trump is mentally ill. The president decided Wednesday that enough is enough. He skewered George Conway on Twitter and slammed him to reporters as he took questions ahead of a departure from the White House. As he left the White House for Ohio hours later, he couldn't resist putting his broadside on videotape. 'I don't know him. He's a whack job, there's no question about it,' the presdient said. 'I think he's doing a tremendous disservice to his wonderful wife. Kellyanne is a wonderful woman, and I call him 'Mr. Kellyanne',' he added. She said Trump had sat on the sidelines of her household's intramural political mudfight long enough. 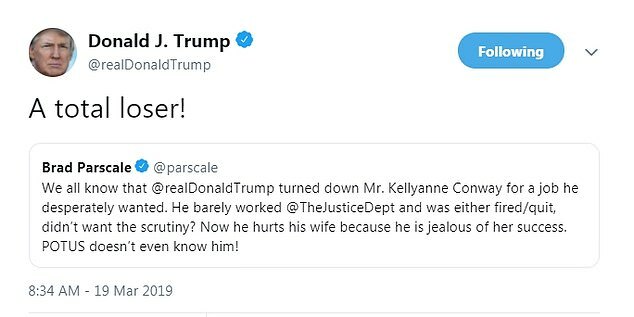 The president's Wednesday morning tweet marked the first time Trump has claimed Kellyanne played a role in her husband's failure to secure a plum Justice Department position in the administration's early days. That claim quickly lost power, however, when The Washington Post released a May 31, 2017 letter from Mr. Conway to the president in which he turned down the position of Assistant Attorney General for the Civil Division of the DOJ. 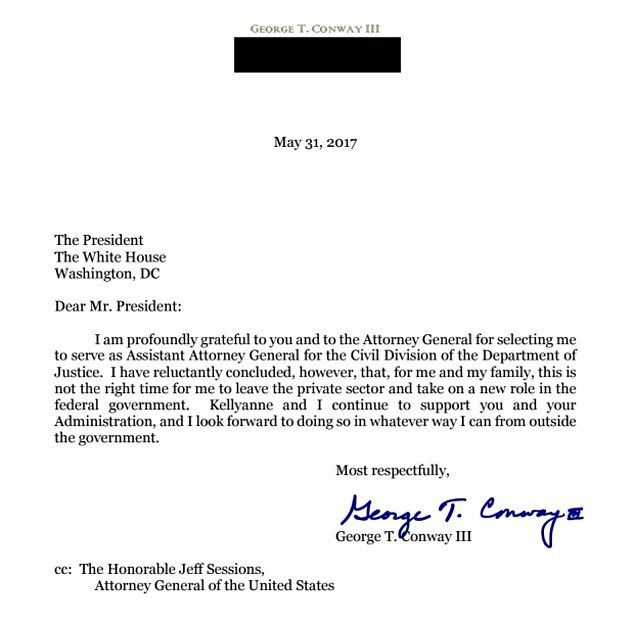 'I am profoundly grateful to you and to the Attorney General for selecting me. ... I have reluctantly concluded, however, that, for me and my family, this is not the right time for me to leave the private sector and take on a new role in the federal government,' the letter reads. 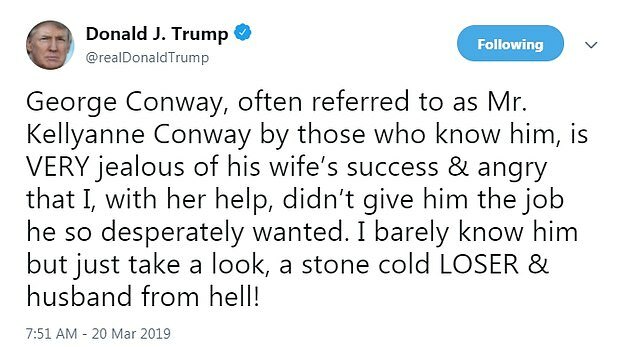 Mrs. Conway was the president's campaign manager in the fall of 2016, the first woman ever to successfully bring a White House campaign across the finish line. Trump's long-simmering feud with Mr. Conway boiled over this week after the attorney claimed online that he is mentally ill and tweeted pages from a standard psychiatric diagnosis manual to back up his assertions. He said in an interview on Tuesday that he takes his anti-Trump frustrations out online so he can avoid disrupting his marriage by complaining directly to his powerful wife about the president he considers insane. 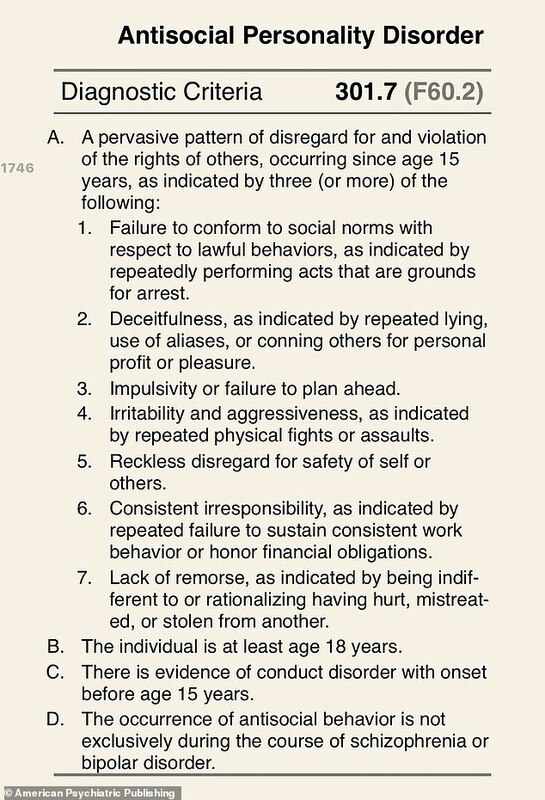 Speaking of the public war of words that led him to tweet a definition of 'narcissistic personality disorder,' he said the armchair diagnosis 'stuck ... because of the utter bizarreness this weekend, his own conduct. It was so illustrative. 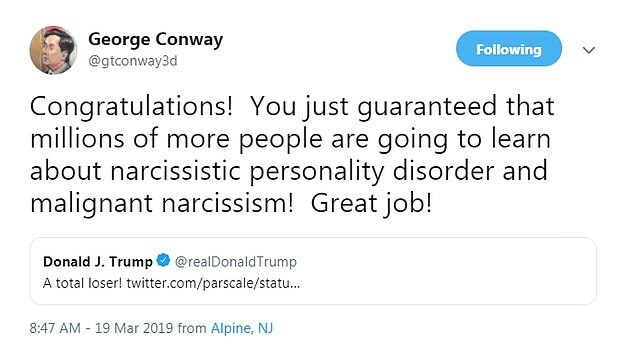 Conway also pushed back on Trump 2020 campaign manager Brad Parscale's claim on Twitter that the president turned Conway down for a senior-level DOJ position. He said he withdrew from consideration after Trump fired his FBI Director, James Comey, a move that led to the appointment of Special Counsel Robert Mueller. 'I'm thinking to myself, this guy is going to be at war with the Justice Department for the next two years. I'm not doing this,' Conway said. Trump had called him 'a total loser' just hours before. And the president's 2020 campaign manager, Brad Parscale, claimed 'Mr. Kellyanne Conway' is 'jealous' of his more-famous wife's success. 'He barely worked @TheJusticeDept and was either fired/quit, didn't want the scrutiny? Now he hurts his wife because he is jealous of her success. POTUS doesn't even know him!' Parscale tweeted Monday night. 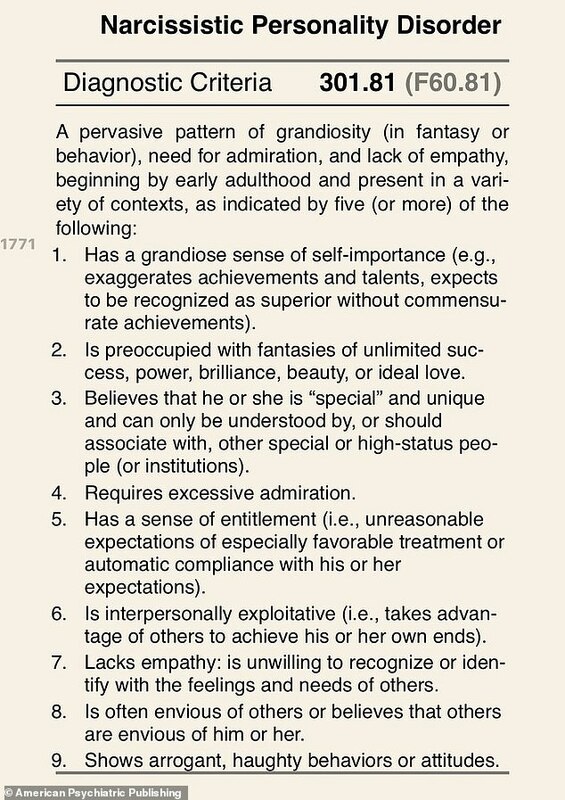 Mr. Conway had launched a barrage of insults at the president on Monday evening, tweeting medical definitions of personality disorders including 'deceitfulness' and grandiosity as symptoms — and saying they apply to the 45th president. His latest criticism of Trump followed a weekend of digital slams from the president against a range of targets including the late Sen. John McCain and Saturday Night Live. Mr. Conway fired back sarcastically at Trump on Monday, tweeting that it wasn't smart of the president to give his amateur head-shrinking a bigger platform. Conway's wife, counselor to the president Kellyanne Conway, brushed off the incident, saying she was taking care of the couple's four children Monday morning and hadn't paid attention. 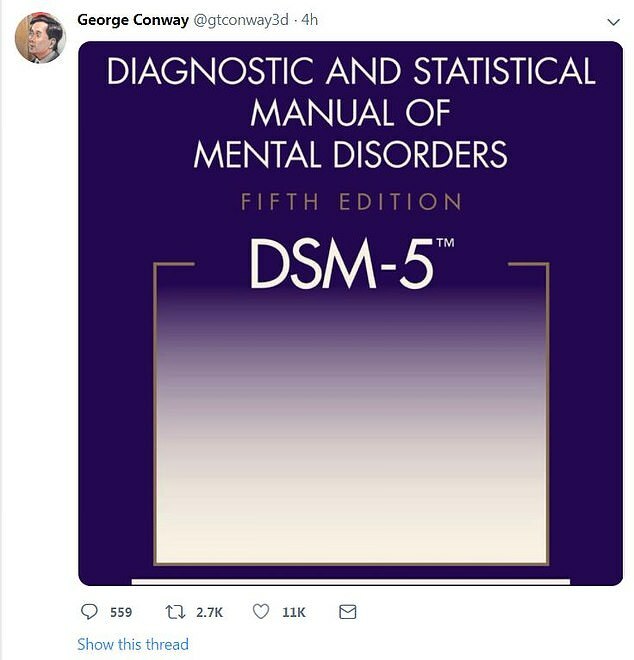 Mr. Conway posted the definition of Narcissistic Personality Disorder; he also tweeted the cover of the latest Diagnostic and Statistical Manual for Mental Disorders in a slap at Trump. According to the definition, someone with the disorder has three or more of a list of symptoms. 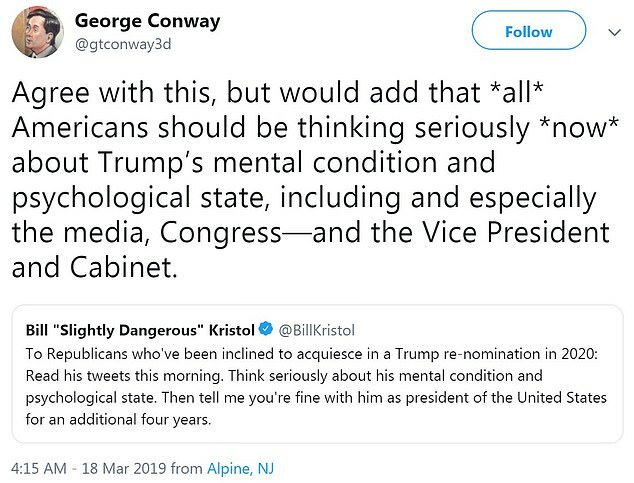 Before his stab at armchair psychiatry, Conway retweeted conservative commentator William Kristol, who urged people to think seriously about Trump's psychological state. 'Agree with this, but would add that *all* Americans should be thinking seriously *now* about Trump's mental condition and psychological state, including and especially the media, Congress — and the Vice President and Cabinet,' Conway wote. Kellyanne Conway commented on the latest instance of her husband torching the president — her boss — brushing off a question by a reporter at the White House. 'I have four kids and I was getting them out of the house this morning before I got here, so I could talk to the president about substance. So I may not be up to speed on the whole thing,' she said. As Conway's tweet attacking the president's alleged narcissism reverberated, Trump weighed in on the New Zealand terror attack that killed 50, defending his own image and complaining that he was being blamed for the slaughter. 'The Fake News Media is working overtime to blame me for the horrible attack in New Zealand. They will have to work very hard to prove that one. So Ridiculous!' the president wrote. Trump got a perfect score on a test designed to look for signs of memory loss or cognitive dysfunction. He bragged about the results as he blamed his predecessors for failing to solve problems in North Korea. 'I guess they all realized they were going to have to leave it to a president that scored the highest on tests,' Trump quipped at the time.